In my quest to corroborate the opinions I developed based on my own experiences, I found myself pulling all the dye books off my shelves and re-reading the sections on madder and madder-relatives. It was fun and informative, but a little dizzying. Madder roots can produce an enormous variety of colors depending on the soil in which the roots were grown, extraction procedure, mordant, pH, fiber, water chemistry, and other factors. I tried to stick to certain parameters in my research (obtaining red and pink as opposed to orange, dyeing cellulose fibers, using an alum mordant) but it’s hard not to get distracted by beauty. Despite all this research I have still not found a clear answer to my questions. In this post I will try to summarize some pertinent ideas from different dyers. Even though I am still not totally confident about the chemistry behind it all, nevertheless I will share two hypotheses about my experiences that seem reasonable to me, and I will explain how my ideas are either supported by or contradicted by my readings. To contextualize this issue a little bit first, I want to emphasize that red is very tricky to get with plant-based dyes (and I am a plant-based dye person). 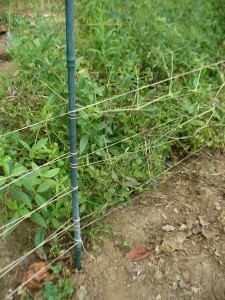 Madder is the pre-eminent source of plant-based reds. When I say madder, I am talking about Rubia tinctorum. It’s a prickly and stiff yet floppy, sprawling sort of plant. Here are some seedlings (already prickly) and a big sprawling patch that I staked up so I could walk between the beds in my dye plant garden. Like many perennials, it takes a while to bloom, and it doesn’t set seed easily. Here are the flowers and some young seed pods. 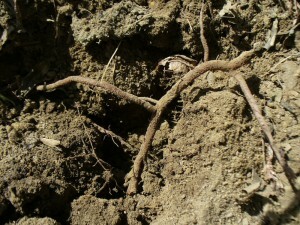 The roots take between 3 and 7 years to mature (develop useful levels of dyestuff) and are hard to dig up and clean. Why bother? Because you want red! I believe that Rubia tinctorum is the most common commercially grown variety of madder, or at least, it is the most commonly imported variety here in my part of the globe. Even though it is cultivated, my understanding is that it is not significantly different from the wild form of R. tinctorum. 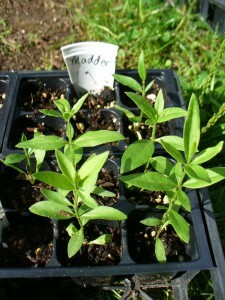 There are lots of madder-relatives in the family Rubiaceae, including the bedstraws (in the genus Galium). 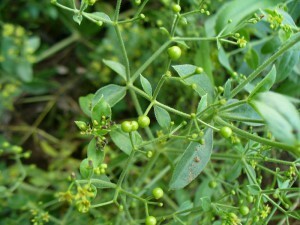 Many contain similar dyestuffs, but in lower concentrations than madder. In contrast to the trickiness of red, yellows and browns are easy to obtain with plant-based dyes. So, if you’re using madder roots, you’re most likely hoping for red, pink, maroon, or a subdued purple. Yellow, brown, or orange are not a dyer’s main objectives with madder. On the contrary, dyers often actively avoid these more common colors when using madder. Madder roots contain a number of different dyestuffs. 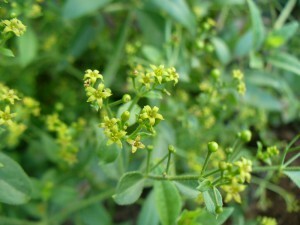 According to Harald Bohmer (Koekboya), madder may contain as many as 15 anthraquinones. He compares the dyestuffs in various madder species, and analyses five in particular: pseudopurpurin, munjistin, purpurin, alizarin, and xanthopurpurin. Jim Liles lists the dyestuffs in madder as: alizarin, purpurin, pseudo-purpurin, xanthin, and chlorogenin (The Art and Craft of Natural Dyeing). I’m not sure why their lists differ slightly. Maybe because chemists change the names of things from time to time? Anyway, the point is that there is not simply one color in madder. It contains dyestuffs which yield various colors including yellow, orange, red, and brown. Each of the different dye molecules in madder has different properties and behaves a little differently. Alizarin is the primary source of red in madder roots. Alizarin is not very water soluble (“slightly to sparingly soluble” according to the Wikipedia article) in either cold or hot water. It only dissolves in an alkaline environment, and even then it takes a long time to dissolve. Hence, if you want red, you have to give the roots plenty of time to release it. You also have to expose as much as possible of the area of the roots that contains the red color, between the skin and the woody core of the roots, by softening and then macerating them (or powdering the roots when dry). Some folks offer suggestions for getting rid of the less desirable yellow and brown shades at the very beginning of the process. Rita Buchanan (A Weaver’s Garden) and Jenny Dean (revised and updated edition of Wild Color) both recommend washing madder roots well, whether home-grown or commercial, to flush away the yellows and browns. Additionally, Jenny Dean suggests repeatedly pouring boiling water over the roots, soaking them briefly, and pouring off the liquid to use as a dyebath “for orange-browns.” Rebecca Burgess (Harvesting Color) suggests discarding the water in which the roots were soaked and adding fresh water to create the dyebath. Either way, use only the liquid from the subsequent extractions if you want clear reds. Many folks recommend extracting the roots multiple times. After this, you can pursue a variety of courses. You can combine the dyebaths and use them together, as suggested by Rita Buchanan (A Dyer’s Garden and A Weaver’s Garden) and Jim Liles (The Art and Craft of Natural Dyeing). You can save the separate extractions and dye the same yarn repeatedly in successive dyebaths (Jill Goodwin in A Dyer’s Manual and Su Grierson in “Lady’s Bedstraw–A Scottish Dyeplant for Wool” in Dyes from Nature). Beyond these general guidelines, exact recipes for handling madder differ quite a bit. For example, exactly what temperature is “too high”? The range of maximum temperatures that different dyers recommend goes from a low end of 140°F (The Complete Guide to Natural Dyeing by Eva Lambert and Tracy Kendall) to a high of 190°F (Jim Liles in The Art and Craft of Natural Dyeing). Most dyers recommend something in the range between 140°F-180°F. Some dyers do not mention pH, calcium or chalk at all. Some dyers specifically say that alizarin is only water-soluble in an alkaline solution (Jill Goodwin, Rita Buchanan), or that you can shift an orange tint toward red with an alkaline modifier (Jenny Dean). Regarding recommendations for pH, the exception is Jim Liles who states that a madder bath for cellulose fibers should be acidic. For exactly how long exactly should you soak the roots? Again there is a range of opinions, with Rita Buchanan on the long end (a month). Most other people recommend several hours, overnight, or 1-2 days. OK, so that’s my overview of recommendations from dyers about getting red rather than orange with your basic immersion bath. There’s a lot more to say, and a great many other skillful dyers whom I have not cited at all, but I’ll stop there for now. So, what are my hypotheses about what was going on in my own dyebaths in November? My first hypothesis is that the molecules that produce yellows and oranges are more soluble than alizarin, and those colors come out of the roots more quickly than the reds. I think this is pretty well supported by my reading, even though no one specifically states that those other molecules are more soluble than alizarin. But it stands to reason that they would be, right? Alizarin is practically insoluble. This is why Jenny Dean, Rita Buchanan, and Rebecca Burgess suggest rinsing thoroughly and/or setting aside the water from the initial brief soaking of the roots. I think this is what happened with my first exhaust bath. As I wrote in my last post, the roots were probably not soaked very long before being extracted initially, and they were certainly not extracted more than once before I got them. This created the orange dyebath which I inherited, and which dyed my first 40/2 linen skein a bright brick-orange. The subsequent 3 skeins of yarn that I dyed in that orange dyebath were all a cotton-linen blend, not pure linen. The next two colors were less yellow and more coral or pale peach. The third cotton-linen skein was actually a terribly boring gray-beige. At this point the orange dyebath was completely brown and murky. I wish I had taken a photo of the muddy brown dyebath, but I didn’t realize at the time how interesting my problem actually was so I just dumped it out in disgust. The yellow and orange molecules are the ones that shift to brown with repeated heating, not the alizarin. A typical madder dyebath contains all the different dyestuffs, with the potential to create yellow, orange, and red. I hypothesize that it’s the yellow and orange ones that get muddy and brown, but you can’t tell because usually they’re all mixed together. I don’t actually think that the red shifts to brown due to high heat. Here’s my reasoning: My original “orange” exhaust bath contained a lot of the yellow and orange-producing dyestuffs. They never got over 160°F but they were heated and cooled repeatedly. After a few exhaust baths, the liquid turned a murky brown and my colors were totally blah. I don’t think an overly-high temperature was the problem. In contrast, I obtained the “pink” dyebaths by re-extracting the roots which had been sitting around being wet for ages. They suffered the same heating and cooling treatment, but they held up with perfect clarity and gave me perfectly pure pinks day after day for a couple weeks. The alizarin wasn’t degraded or shifted during all that time. I didn’t find any direct evidence in my readings to support this, mind you, so I’m going out on a limb with this idea. Most dyers blame the color shift to brown on overly high temperatures. Many state (or imply) that it’s specifically the red that shifts to brown. In conclusions, most other dyers I’ve read share the opinion that excessive heat degrades the red and turns it brown. I found only two passages in my readings that might support my hypothesis. The first is from Jim Liles (The Art of Craft of Natural Dyeing) who writes, “Prolonged dyeing at high temperatures dulls the color of the important constituent (alizarin), mostly by means of the xanthin (yellow) and the chlorogenin (orange).” I am not sure exactly what the mechanism might be, here. Does the alizarin break down and so the other colors dominate, visually? So there you have it. My hypothesis is certainly not shared by others, and is perhaps based on an inadequate understanding of chemistry. My father used to say that all questions could be divided into two categories. The questions in one category could be answered by the phrase, “Time will tell.” For questions in the other category, the answer was, “We’ll never know.” I hope this is a “Time will tell” question!